I came home from my trip Saturday, instead of Monday. I got back to a very strange situation. My heart is broken and I have no idea why or how or anything. I am on autopilot and taking care of my dogs and cannot think of anything to write. I am now at our friend's home in Denmark after a pretty awful 2 day drive.I normally get here the same day I leave but couldn't manage it. I was incredibly lucky in Germany. I had forgotten one of my drugs and needed them so I went to a Pharmacy and explained my problem. I assumed they would call a Doctor or send me to a hospital. But no, they gave me 100 pills of the prescription only drug! I am very grateful. 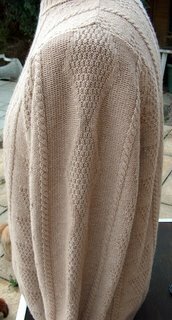 On Monday we will go into Copenhagen where I have planned to meet another knitter whom I 'know' thru a knitting email list. We are leaving tomorrow for our trip to see friends and dogs in Sweden, Denmark, Germany and France. We will be back on the 28th of this month. This is made from 100% Camel Hair from COLOURMART UK. I used 2 x 2/15's. The design is my own and I used the Brother Garter Carriage. 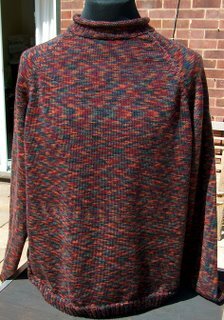 The sweater has been washed and tumble dried on hot. 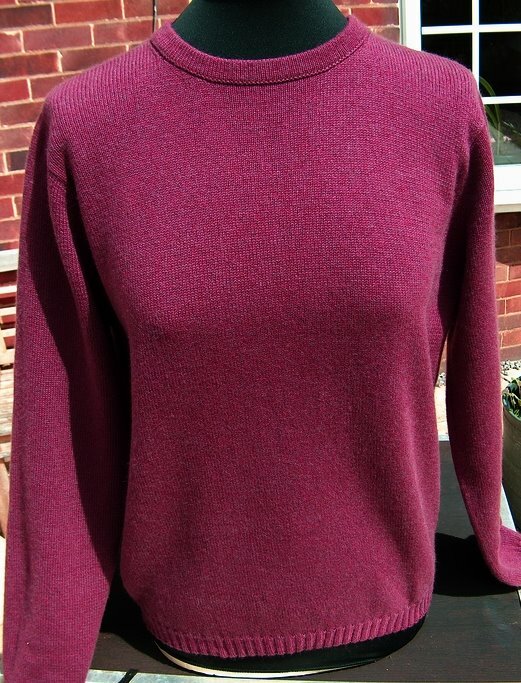 It has set in sleeves and fully fashioned shaping. It is 62 cm wide and 68cm long. It weighs 590 gms after washing. I tried using one strand on my fine gauge machine but it wasn't satisfactory. It works much better with two strands which equals 2/7.5. There is much hand manipulation here, cabling every 4 rows. Many people who are suffering dream of the day their suffering stops. In the case of a physical illness, their dream will come true. The suffering will stop either because they get better or they die. With the other kind of suffering, soul pain, it is not quite the same. No amount of support or therapy or praying or drugs or drink or food or cleaning or any other coping mechanism will make you as if you didn't get abused, or raped, or have a loved one die. Nothing will alter your past. Nothing. You can only alter today. Your past will always be your past. You will always be who you are today because of your past. You cannot alter that. There will come a time when you will glad that you cannot. Good loving support will enable you to live with your past and your pain. It will not remove it. Therapy will not 'cure' you. Instead, you will grow in strength and understanding and thus your burden becomes something that you can carry and live well with instead of this this monstrous thing that crushes you. Everyone has their cross to carry. EVERYONE. We don't get to put it down. We do however get to live. If we choose to and if we get the right help. We can be joyous and free despite what we carry with us. We grow in strength and we do not ache and crumble under it's weight. As we grow in strength, we grow in wisdom and compassion and tolerance. We give to others what we are receivng ourselves. We let go of old ways of thinking. We become willing to change. This in itself can be very painful. Letting go of long held beliefs is not easy. Viewing the world through a different mind is not easy. Hence nervous breakdowns, when our world view comes crashing down around us because we can no longer hold it together because we see it is flawed. This is a good thing and maybe should be called a nervous breakthrough! It gives us the chance to build anew, to ditch old, harmful thinking. The most painful changes we make will involve ditching much of what we were taught to think. One of the ways in which abusive people work, is by teaching lies to their victims. Most especially children. They do it because it works! They know that what you teach a child, they are likely to stick with. Hence religious fundamentalists are very much into converting children-their own or others. It is abuse, pure and simple. It takes tremendous courage and work to break free from it. As a result, many do not break free and they continue the cycle. The same principle applies to siblings in an abusive home. One sibling may break free and be branded sick or wicked or deranged etc by the other siblings who do not have the courage to face the truth. They would rather live with the lie and the fantasy that they are loved than face the terrible truth. It is why we so often blame ourselves for our abuse. Don't allow fear to stop you living. Don't imagine that your pain will be removed, that your past will be obliterated. It won't be. Do know that your life can be truly free and wonderful, despite all that has transpired and that in itself is not just a miracle but the best possible vengeance you could wish for. 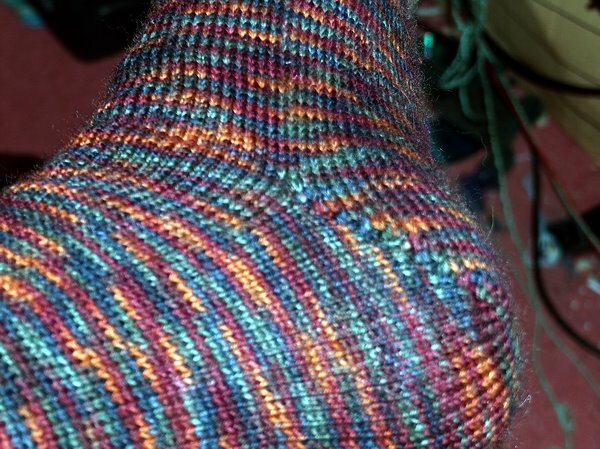 Well, I finished the socks to go with the sweater. I knit these with one circular needle, using Magic Loop method. 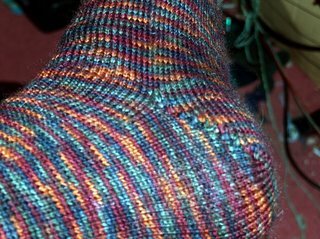 Cast on 72 sts with 3.5mm needle, using continental method. 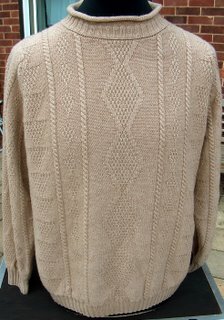 I knit 24 rows of 2x2 rib using 2mm needle. 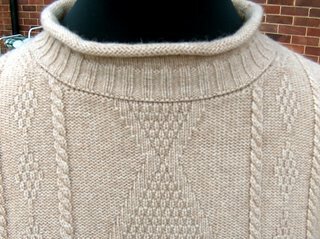 I then knit the body using 2.25mm needle, increasing to 80 sts by increasing 4sts after first 4 rows and then again after another 4 rows. The heel was done using a modified Sherman Heel. Modified because I no longer know if I follow the pattern, I just do it. I do know that I slip sts on the way back which the original doesn't. Whatever, I find this the easiest heel to do and by far the best looking with no holes. 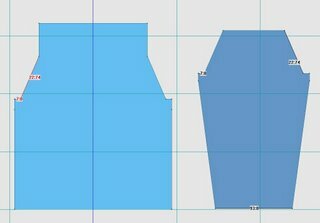 Below is the shape I designed which I use on all my set in sleeve sweaters, either handknit or machine knit. 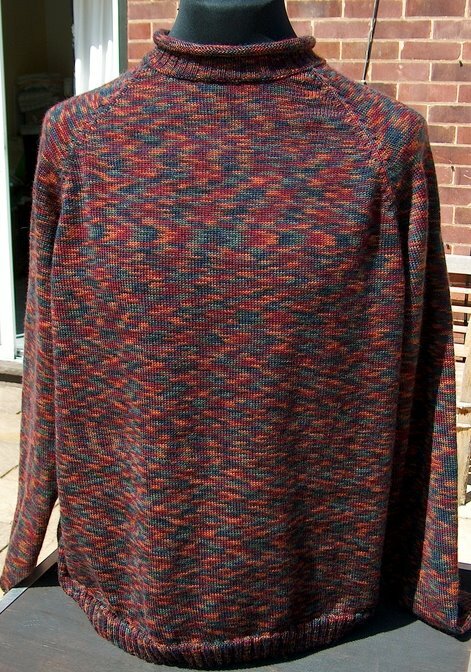 Below that is a picture of a hand knit I used this sleeve on and in the post below that is a machine knit. 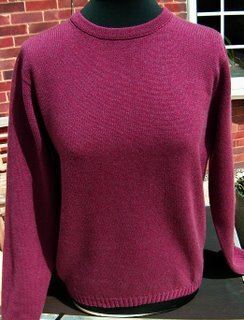 Woman's cashmere set in sleeve sweater, size 36", tapered so that hem is 34". The colour is more wine than the picture shows. Tension is 37sts and 58 rows to 10cm. This has been washed and tumble dried on hot twice. 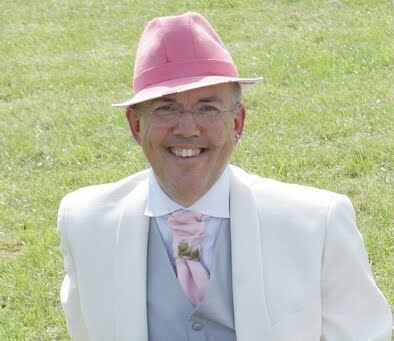 This is more representative of the colour. 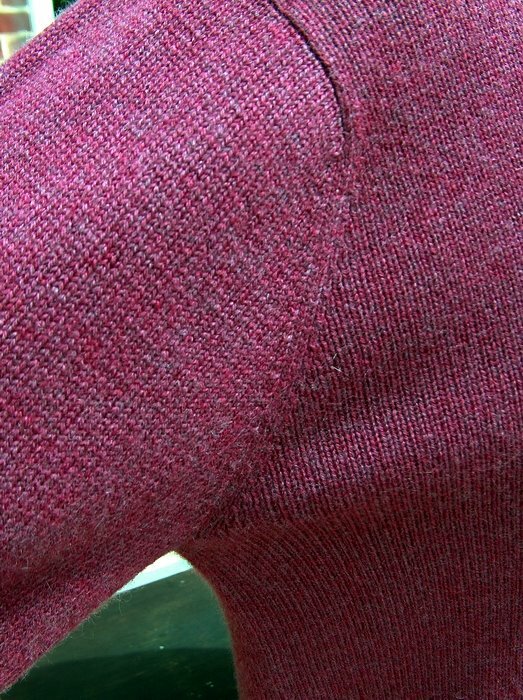 This sleeve head is the half raglan style I have mentioned before. It is now my standard sleeve head for a set in sleeve. 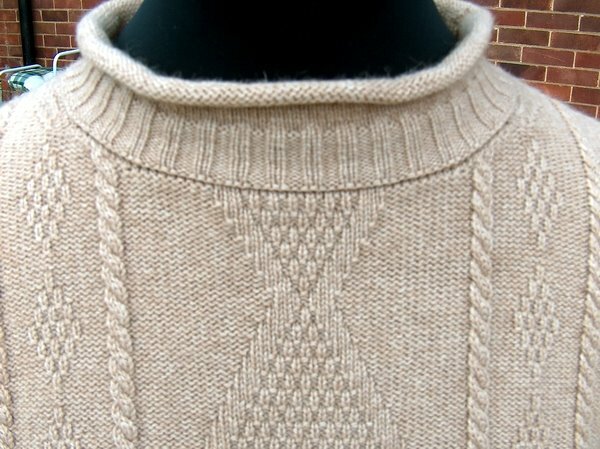 It is easy to knit and fits really well. 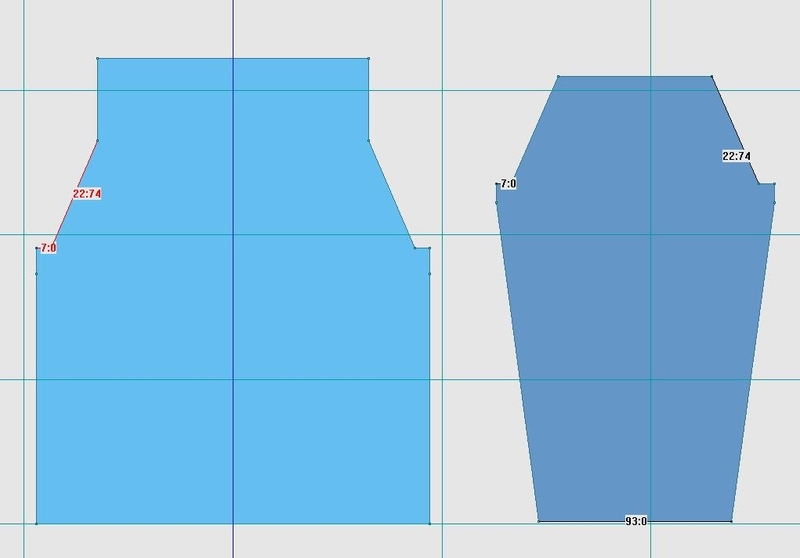 I have tried other more rounded sleeve heads and do not care for them. This gives a confortable, well fitted head and looks good too. 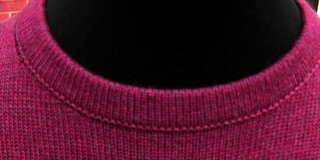 Close up of neck band to show how it fits to body. It is 7cm deep at front, 2 cm deep at back and 16 cm wide. Last Sunday, on the way to Leicester to pick up Tilly who had been off on 'honeymoon', I had to stop the car to get out as the pain was really bad. Not happened like that before. I didn't have my drugs with me so bought some over the counter Ibuprofen. Helped, but not much. Anyway, picked up Tilly. When we got home, Micah tried to mate her and Tilly told him where to go, so that is a good sign. Have not been very succesful with Tilly in that we usually mated her too early and so she missed. She is a bit of a tart and will mate more or less as soon as she is in season and over a 8 day period which is not that normal. This time, the stud owner allowed them to shag their brains out for a week, until Tilly told the stud to f**k off. Hopefully this time she is pregnant. As the week wore on, the pain got worse. It seems I am only comfortable, almost, lying on my side in bed. Sitting is terrible and standing soon gets worse. Anyway, my dear Niki came over for our weekly day out. We do this once a week as it gets me out and with her help I am able to do the main shop and generally have a good time. She is really very kind and never has to be told what I need. she anticipates everything. Fortunately we both love shopping. Thursday was the day. We had to abandon it tho and come home. Not only was the pain really ick but I just couldn't function properly. My speech got all slurred, I became very vague and in the Opticians I staggered about and knocked stuff over! They know I have a condition so no problems. My doctor happened to be passing in her car as I was leaving the Optician and she called me later at home and said she wanted to see me. Just to make sure I was okay. My blood pressure was 111/67 which I am very pleased with! The usual lecture about resting and taking my drugs, of which she gave me a whole sack full! Honestly, I have enough to open my own Pharmacy. I do like the idea of having enough to bump myself off in case of nuclear attack or another Cher farewell tour. 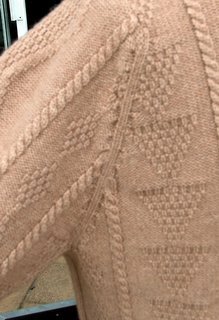 I am knitting a 100% camel hair sweater on with the GC right now. Cables and DMS and stuff. Taking forever as I have to cable every 4 rows but I really like this design and can't wait till it is finished. And I dumped yet another sweater this week! My second in as many weeks. This was cashmere! Wine coloured and a ladies one. I had sewn in the first sleeve and did the neckband and was checking neckband was loose enough when I noticed a tear in the fabric, on the front, over where a breast would be. ACK! Anyway, I tired, even tho I knew I would fail, to undo my sewing. Impossible. So now it is in the bin. Tomorrow is the South Eastern Lhasa Apso Society's Champ Show. We are going with Moon. Only about 80 miles away. Next Saturday, 12th, is Bournemouth Champ show and that is about 180 miles away! Thankfully I don't go to shows on my own so even if I am very sore tomorrow like today, I'll still managed my minute walk in the ring! On the 17th we are off to see friends in Denmark and Sweden and catching 3 days in Hamburg on the way home. Hopefully we'll be popping into Laurent and Francois too to see them and see what new males they have that I might want to use on my girls. Oh, and I will also go see Sten and Ingla nr Falkenberg in Sweden to see their new boys. Will be away 12 days and Niki will be living here to take care of my dogs. 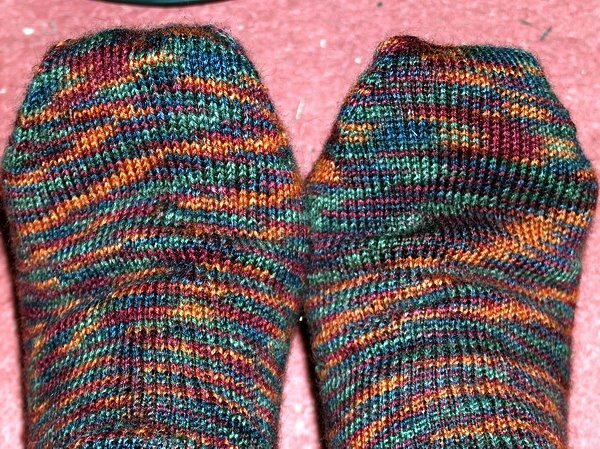 Oh and I am still doing my hand knit aran and am at present knitting a pair of socks. 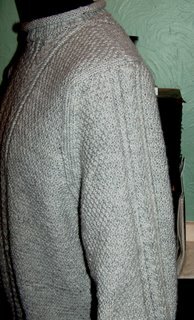 The bamboo hand knit is coming along too. Oh, if only I could stay awake 24 hrs or the days were longer or something.